Sweeter, smoother and creamier than store bought cups, these oversized decadent treats are sure to please. 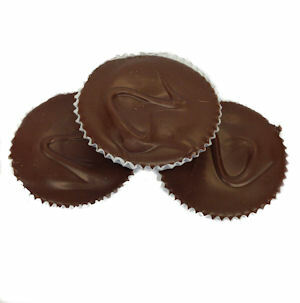 Each peanut butter cup is about 2 inches in diameter and has a rich and thick milk chocolate shell. Milk Chocolate [Sugar, Milk, Cocoa Butter, Chocolate Liquor, Soy Lecithin (an emulsifier) and Vanillin], Peanut Flavored Coating (Sugar, Palm Kernel Oil, Partially Defatted Peanut Flour, Non-Fat Dry Milk Solids, Peanut Oil, Salt and Soy Lecithin), Stabilized Peanut Butter (Peanuts and Partially Hydrogenated Palm Kernel Oil), Chocolate Bottom Coat (Sugar, Partially Hydrogenated Palm Oil, Cocoa, Whole and Non-Fat Milk and Soy Lecithin), White Coating [Sugar, Palm Kernel Oil, Sweet Dairy Whey (milk), Lactose (milk), Milk Fat, Non-Fat Milk, Buttermilk, Sodium Caseinate (milk), Soy Lecithin, Hydrogenated Palm Oil and Artificial Flavors] and Salt. May contain Wheat, Milk, Peanuts, Tree Nuts, Soybeans and/or Eggs.